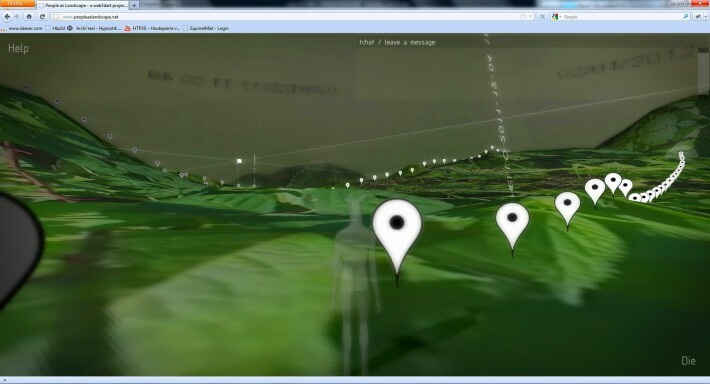 PaL is a real-time 3D landscape on the internet. A seemingly endless algorithmic landscape/ground is generated in this digital space. This virtual world is multi-user, and a chat allows to communicate with other participants. Internet users, according to their choice of ground texture and sound environments, can chat with other avatars who have simultaneously a different perception of the same field. Grégoire Zabé is a new media artist, his main interests are in collaborative cyberspaces, evolutive representation systems, internet as a dimentional and social space, individuals plunged into global media context. “Through an open and exploratory approach, I try to crystallize these materials and to create collective representations of landscapes, on the internet, with the participation of spectators-users.